Two elected leaders and a roundtable of University of Michigan researchers convened at the Ford School on August 11 to mark the 50th anniversary of the legislation that created the Medicare system and the 80th anniversary of Social Security's creation. 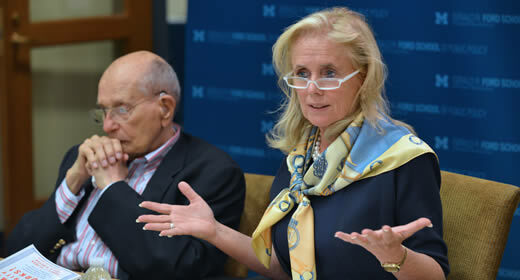 U.S. Representative Debbie Dingell and former U.S. Representative John Dingell were joined by hosts John Ayanian, director of the Institute for Healthcare Policy & Innovation, and the Ford School's Dean Susan M. Collins. Their purpose: a discussion on the past, present, and future of landmark Medicare/Medicaid and Social Security legislation. U-M health scholars participating in the roundtable included Rick Bossard, Matt Davis, Justin Dimick, Mark Fendrick, James Haveman, Peter Jacobson, Eve Kerr, Kenneth Langa, Helen Levy, Jenifer Martin, Andy Ryan, Erica Solway, David Spahlinger, Marianne Udow-Phillips, Brent Williams, Cynthia Wilbanks, and Martha Darling. John Dingell, Jr., who represented southeast Michigan in the U.S. House for 65 years, co-sponsored the 1965 Medicare/Medicaid legislation that created health insurance programs that now cover 1 in 3 Americans. His father, John Dingell, Sr., co-sponsored the legislation that created the Social Security Administration. Debbie Dingell, in office since January 2015 to represent Michigan's 12th District, including Ann Arbor, has proposed legislation to expand Medicare benefits. The event, the latest product of a long-time relationship between the Dingells and the Ford School and University of Michigan, received attention from MLive and the Michigan Daily. The University of Michigan Health System has also curated a Storify of social and multimedia content surrounding the anniversary roundtable. Full-length video of the discussion is available in our video library, and photos can be viewed and downloaded from the Ford School's Flickr album.